WARSAW, Poland - Poland on Sunday sought to defend remarks by its prime minister which Israeli leader Benjamin Netanyahu called "unacceptable" and tantamount to denying the Holocaust. "The comments of Prime Minister Mateusz Morawiecki during a discussion in Munich were by no means intended to deny the Holocaust, or charge the Jewish victims of the Holocaust with responsibility for what was a Nazi German perpetrated genocide," Morawiecki's spokeswoman Joanna Kopcinska said in a statement. 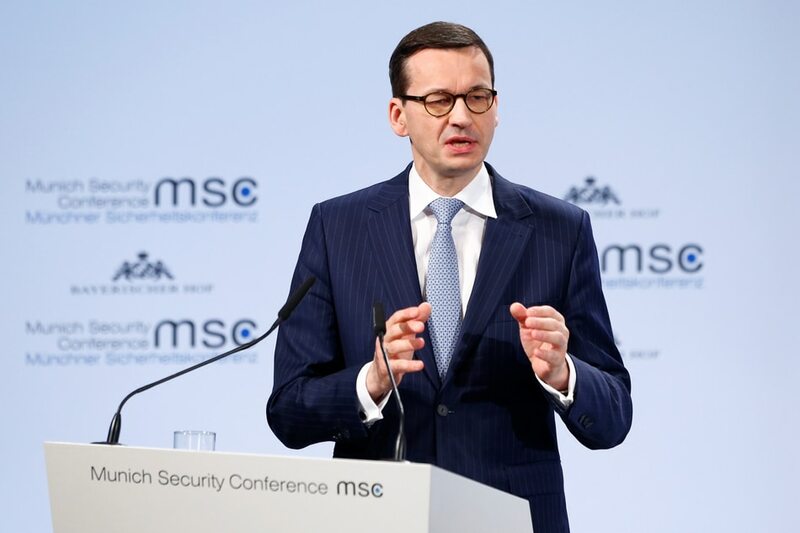 The Israeli premier, who like Morawiecki was in Munich for a global security conference, laid into his opposite number in a terse telephone call on Sunday over his remark the previous day that the Holocaust had involved "Jewish perpetrators" as well as Polish ones. "He told him that the remarks that were made were unacceptable and that there was no basis for comparing the actions of Poles during the Holocaust to those of Jews," Netanyahu's office said in an English language statement. Israeli police on Sunday published pictures of graffiti discovered on the gates of Poland's embassy in Tel Aviv, which included Nazi swastikas and the word "murderer" in English. The building was closed to the public as is usual on Saturday and Sunday. "Prime Minister Netanyahu pointed out that the goal of the Holocaust was to destroy the Jewish people and that all Jews were under sentence of death," the Israeli statement said. "He told his Polish counterpart that the distortion regarding Poland could not be corrected by means of another distortion. "The two agreed that the countries would continue their dialogue on the matter and that to this end the teams would hopefully meet soon." Morawiecki's spokeswoman said earlier Sunday that the Polish prime minister "has repeatedly and categorically opposed denial of the Holocaust -- the murder of European Jewry -- as well as anti-Semitism in all its forms". Morawiecki's claim about the Holocaust's perpetrators came amid an unprecedented diplomatic row with Israel sparked by a controversial law passed by Poland's senate this month. On Saturday Morawiecki had been questioned by a journalist who told of his mother's narrow escape from the Gestapo in Poland after learning that neighbours were planning to denounce them, and asked if recounting that would now be against the law in Poland. After a slew of negative reactions to the comments, the Polish PM's spokeswoman sought to clarify the remark saying his words "should be interpreted as a sincere call for open discussion of crimes committed against Jews during the Holocaust, regardless of the nationality of those involved in each crime." "Each crime must be judged individually, and no single act of wickedness should burden with responsibility entire nations, which were conquered and enslaved by Nazi Germany," she said.